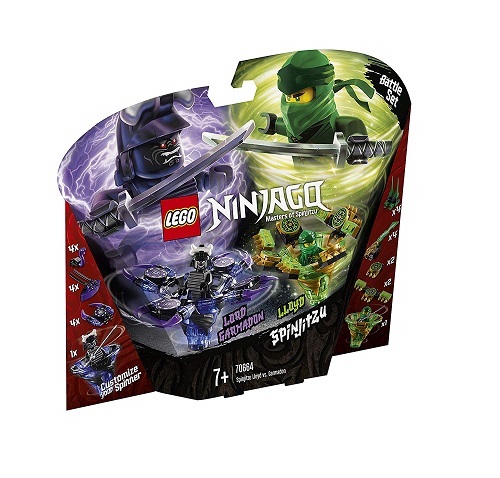 Duel for Spinjitzu victory with Lloyd and Lord Garmadon’s ninja spinners! 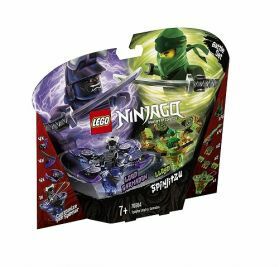 Stage a battle between the good son and evil father with LEGO® NINJAGO® 70664 Spinjitzu Lloyd vs. Garmadon. This ninja toy features Green Ninja Lloyd’s Spinjitzu Tornado of Energy and Lord Garmadon’s Spinjitzu Tornado of Destruction spinner toys, each with a new-for-January-2019 spinner element and 3 attachments for attack, defense and speed modes. Try different techniques with these cool NINJAGO spinners, create your own challenges and compete against your friends—the possibilities are endless. 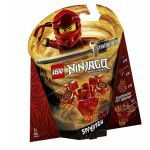 This LEGO NINJAGO set includes Lloyd and Lord Garmadon minifigures with katanas, plus 6 buildable display racks for attachment weapons and elements. 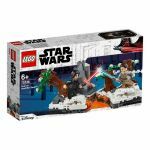 Includes Lloyd and Lord Garmadon minifigures, each with silver-colored katanas. 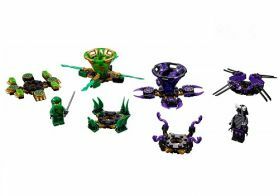 Lloyd’s Spinjitzu Tornado of Energy spinner and Lord Garmadon’s Tornado of Destruction spinner each feature a new-for-January-2019 spinner element and 3 different attachments for attack, defense and speed modes. Lloyd's spinner's attack mode attachment features 4 Energy Blades; defense mode attachment features 4 energy elements; speed mode attachment features 4 spikes. Lord Garmadon's spinner's attack mode attachment features 4 double daggers; defense mode attachment features 4 destruction token elements; speed mode attachment features 4 spikes. 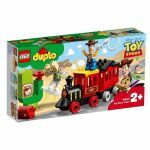 This spinner toy pack also includes 6 buildable display racks for attachment weapons and elements. Create your own Spinjitzu challenges and spinner competitions against your friends. 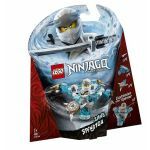 Combine with 70659 Spinjitzu Kai, 70660 Spinjitzu Jay, 70661 Spinjitzu Zane, 70662 Spinjitzu Cole and 70663 Spinjitzu Nya & Wu LEGO® NINJAGO® toys for thrilling Spinjitzu showdowns. Recreate the ninja tornado effect as seen on the NINJAGO® Masters of Spinjitzu TV show. Each spinner (without attachments) measures over 1” (4cm) high, 1” (5cm) long and 1” (5cm) wide. 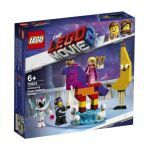 So why not buy the Spinjitzu Lloyd vs. Garmadon set today ?